Back when I talked about the NX rumors during the podcast, I expressed skepticism of the target market such a console would have. I was skeptical of exactly how such a system would market itself and compete with other consoles and mobile devices. I expressed plenty of skepticism of the whole idea in general. Well, not everything. I thought the change to game cartridges is a great idea. With the reveal of the Switch, I am still plenty skeptical. I am looking at this console and trying to figure out how it will fit in my life. I play plenty of home console games. I play plenty of mobile games. I have a mobile phone that I play games on as well as a DS and PSP that get plenty of game time, although not as much as my consoles and phone. But this console, seems a rather odd fit for me. I am a father. I have a wife and kids. Nothing in the trailer above seems to show how we might interact with the system. 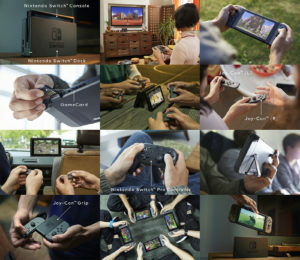 The trailer shows a person playing the Switch and then having to go somewhere and taking the Switch with them. But if I am playing the console and take it with me on a business trip or something, what is my family supposed to do when they want to play? Sure this isn’t a problem when we are travelling together. But if I am travelling alone, I can’t just take their console from them. Sure I have plenty of other game systems that they can play. But that isn’t the point. What if I didn’t and this is our first console? Or heck, even this being the new console in the house makes it a hot commodity for the first few months. So there is zero travelling with it during that time. The same goes for school breaks. They will want it at home during the day. Then we have the problem of the detachable controllers. I have a hard enough time keeping track of all of our full sized game controllers. Imagine how much worse it will be when my kids lose one of those dainty controllers. They would lose one of those things in no time flat. Next is battery life. How long will the battery in the system last? My PSP gets about 3-4 hours of continuous use. I think the Vita has improved on that a bit. Tablets, ranging from generic Android tablets to Kindle Fire and iPad 4, get about the same. I assume that you will need to lug around a charging cable for the system when it is not docked. Then we have the battery on the controllers. I would hope they have built in rechargeable batteries. Controller batteries tend to have a longer life than a system. However, we do have the problems of bad batteries. What if one of the controllers has a bad battery or just stops recharging. Then you are stuck with only half a controller. Yes, I am griping. Not because I hate the Switch or even the idea of the Switch. I actually think it is cool. But like I said above, I have a hard time figuring out how this fits into my life outside of just being docked 100% of the time and used as a home console. I am glad plenty of people are excited about this. This is a novel approach to gaming. Nintendo has always had a very strong portable game lineup and this seems like the natural progression for them. It combines both their hardware departments into a single unit and all their developers will be able to focus on making the best games possible for a single system. That said, I think the 3DS still has a few more good years left to go. 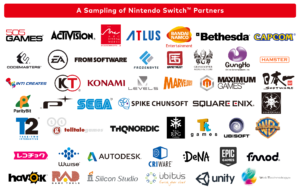 But it is reassuring to see how many developers and publishers are listed as partners. The trailer even showed a couple of their games off. I saw what looked like Skyrim and an NBA title. I hope that whatever they are doing to get these developers on board for launch will keep them involved and excited through the life of the system. I have also already seen a great number of indie developers hoping to start working on porting their titles now. So, what did you guys think of the reveal? Are you excited? You going to get one? Not really when you consider they are already rereleasing Skyrim with better graphics on the PS4 and XBoxOne. Yes, but being released on a console is not the same thing as being featured in a launch trailer for one. I would have expected to see all new games featured. Hell, Skyrim came out before the Wii U did. It’s been in rock-bottom, all-DLC sales multiple times now. Who is Nintendo expecting to be excited about it? Most people have either already played it years ago, or just weren’t that interested in playing it. I’m not saying Skyrim shouldn’t come out for the Switch, I’m just scratching my head at its placement in the announcement trailer. I would suspect that, the way they advertised it, that it should have atleast 5 or 6 hours of life, since they were advertising how much on the go you can use it for, including using it on a flight (Which, side note, I have a gripe with that scene, because the space between those seats are highly unrealistic). That leaves the question on power. The only info that has come out that it’s nvidia that is supplying the GPU tech. Which, hey, I’m glad they are doing that, means that nvidia is finally getting into mainstream console markets. And what with their shield tech and their phone GPU tech, we can probably assume that they are on par if not better than first gen Nvidia Shield. Most likely better since the shield is a few years old now. Though something else that was interesting, was the list of partners, even Take 2 was on the list. Incoming Red Dead Redemption 2? They did show a basketball game. I am no expert in this but it could have been an NBA 2k game which would explain Take 2 being there and Rockstar not. Rockstar is a big enough name of its own that it would warrant a listing of its own. Don’t quote me on that, but the RDR2 trailer didn’t have any systems in it and the video desription only listed PS4 and XBone.